We analyzed the ultrasonographic (US) features of the Achilles tendon (AT), paratenon (AP), and enthesis in patients with axial spondyloarthropathies (SpA) and rheumatoid arthritis (RA), and compared these to healthy subjects. Relationships between these findings and clinical and functional parameters were identified. The study included 40 axial SpA and 27 RA patients, as well as 30 healthy subjects. Clinical evaluation relied on the Bath Ankylosing Spondylitis Disease Activity Index (BASDAI), Bath AS Functional Index (BASFI), AS Quality of Life Questionnaire (ASQoL), Disease Activity Score 28 (DAS28), and Health Assessment Questionnaire (HAQ), as well as on a visual analog scale (VAS) for entheseal pain and the Madrid Sonographic Enthesistis Index (MASEI). Separately, AT thickness, AP thickness, and echogenicity were examined bilaterally with US in 194 ankle regions. The fibrillar pattern of the AT was damaged in axial SpA patients compared to RA patients and healthy subjects (p < 0.001). The AT was thicker in axial SpA patients than in RA patients and healthy subjects (p < 0.05). The AP was thicker in axial SpA patients (p < 0.05). There were positive correlations of BASDAI and BASFI scores with the Achilles enthesitis total score (r = 0.523, p = 0.001 and r = 0.533, p = 0.001, respectively). In the multiple linear regression model, only age continued to show an effect on the Achilles enthesitis total scores in axial SpA patients (B = 0.091, β = 0.417, p = 0.011). The AT thickness was consistently positively correlated with height in axial SpA patients (B = 0.059, β = 0.482, p = 0.004). The AT thickness was affected much more by the height of patients with axial SpA in comparison to RA patients and healthy subjects. Age was an independent factor for high Achilles enthesitis scores only in axial SpA. 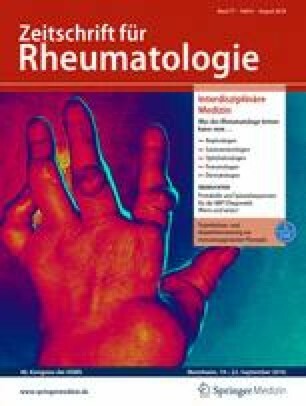 Die Merkmale der Achillessehne („Achilles tendon“, AT), des Sehnengleitgewebes („Achilles paratenon“, AP) und der Sehnenansätze im Ultraschall (US) bei Patienten mit axialer Spondylarthropathie (SpA) und rheumatoider Arthritis (RA) wurden untersucht und mit gesunden Kontrollen verglichen. Dann wurden Zusammenhänge zwischen diesen Befunden und klinischen sowie funktionellen Parametern ermittelt. Die Studie umfasste 40 Patienten mit axialer SpA und 27 RA-Patienten sowie 30 gesunde Kontrollen. Die klinische Untersuchung basierte auf dem Bath Ankylosing Spondylitis Disease Activity Index (BASDAI), Bath AS Functional Index (BASFI), AS Quality of Life Questionnaire (ASQoL), Disease Activity Score 28 (DAS28) und dem Health Assessment Questionnaire (HAQ) sowie auf einer Visuellen Analogskala (VAS) für Schmerzen der Sehnenansätze und dem Madrid Sonographic Enthesistis Index (MASEI). Darüber hinaus wurden AT-Dicke, AP-Dicke und Echogenität bilateral mit US im Bereich von 194 Sprunggelenken untersucht. Das fibrilläre Muster der AT war bei Patienten mit axialer SpA im Vergleich zu RA-Patienten und gesunden Kontrollen gestört (p < 0,001). Die AT war bei Patienten mit axialer SpA dicker als bei RA-Patienten und gesunden Kontrollen (p < 0,05). Auch die AP war dicker bei axialer SpA (p < 0,05). Es bestanden positive Korrelationen des BASDAI- und BASFI-Scores mit dem Gesamtwert für Achilles-Enthesitis (r = 0,523; p = 0,001 bzw. r = 0,533; p = 0,001). Im Modell der multiplen linearen Regression wies nur das Alter kontinuierlich einen Einfluss auf den Gesamtwert für Achilles-Enthesitis bei Patienten mit axialer SpA auf (B = 0,091; β = 0,417; p = 0,011). Die AT-Dicke war durchgehend positiv mit der Körpergröße bei Patienten mit axialer SpA korreliert (B = 0,059; β = 0,482; p = 0,004). Die AT-Dicke war im Vergleich zu RA-Patienten und gesunden Kontrollen deutlicher von der Körpergröße der Patienten mit axialer SpA beeinflusst. Alter war nur bei axialer SpA ein unabhängiger Faktor für hohe Achilles-Enthesitis-Scores. H. Harman and E. Süleyman declare that they have no competing interests. The study was performed in accordance with the Declaration of Helsinki and was approved by the independent ethics committee of Sakarya University Faculty of Medicine. All patients signed informed consent to participate in the study, and for the collection and publication of the data.